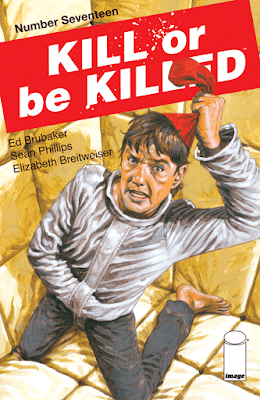 Matt C: Before Lazarus makes a welcome return, Kill Or Be Killed is, for my money, the best ongoing on the stands (Mister Miracle is a limited series!). Dylan Cross remains locked up in a mental hospital while someone on the outside makes a misguided attempt to continue his work, and whether this is the demon's masterplan or an aspect of Dylan's madness... well, only Ed Brubaker and Sean Phillips can say for sure, and let's hope they continue to take their time in saying it. Also from Image is Descender #28; it may not get the attention that some of Jeff Lemire's output gets around these parts but it has been consistently excellent, a thoughtful and emotional meditation on the nature of humanity and sentience. Marvel's big book this Wednesday will surely be Mighty Thor #705. The Jane-Foster-As-Thor storyline only had a limited shelflife (it was inevitable the Odinson would eventually return to centre stage) but it appears we're heading to the most heartwrenching of conclusions based on the trajectory of recent issues. Will there be something in my eye by the time it's all over (or as over as things can ever be)? It seems guaranteed. Jo S: A busy week in comics for me, with a tidy stack of my most reliable favourites all popping up at once. Vinegar Teeth, a bizarre tale of a giant interdimensional, um, thing that looks like a testicle with tentacles which also solves crime, takes the award for ‘comic description I don't think I'll ever need to reuse’ but has a level of insane charm which is infectious, along with the kind of quirky artwork which keeps me fascinated. It’s one of three #3s this week for me - Nick Wilson is back again in his further adventures, as is Ice Cream Man; last month the latter was pretty darkly self-destructive but I like the idea of these connected stories on a theme, each a gory confection filled with dark gooey grossness. A double bill of Hawkeye is next up - I have mixed feelings about the Tales Of Suspense Barton-Barnes two-hander; the tale is indeed intriguing but the action lacks something; I'll need to re-read the first Old Man Hawkeye - I have a warm but unspecific ‘I liked the first one’ feeling and will need to freshen up the memory before plunging into the second of the series. Just a single issue #1 finds space this week - Lucy Dreaming springs forth from the pen of Max Bemis, who has been impressing my PCG colleagues with Moon Knight recently: BOOM! Studios have definitely caught my attention with a number of recent releases and my trust in them to produce something a little different and a little daring grows apace.